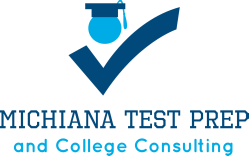 Michiana Test Prep is now called Dr. Carlin's Test Prep and we have a brand new website. We still offer SAT and ACT Prep Courses (both in-person and webinar formats) and college consulting. To be redirected to our new site, please click HERE.